Well, howdy folks! It’s just about to jump into December and I am super excited to officially announce this on my website. Although I have already told every one via Social Media. I am happy to say that I am now officially an Ernie Ball Musicman endorsee. Just waited for a photo and bio and soon my face will be up there on the website. Why did I choose Musicman? Why did they choose me? The new 2018-19 models are lighter in weight, with roasted maple neck and fingerboard for the Stingray Special series. Their new 18 Volt pre-amp sounds stunning and is very easy to use with the 3 band EQ. The finish of the body is superb. The neck feels amazing to play with beautifully finished frets, and the action and intonation were spot on right out of the hard case. I have never acquired any bass in my life that has been gig ready out of the case. They have always needed some form of tweaking to get them to play how I want it to. Musicman are a global company, but with small family business ethics. I like that. There’s support there from a large company, but there’s also that personal touch, so you’re not just another customer. I like that too. Now, I know that sounds like marketing spiel, and while I have been give this magnificent instrument, it’s also been a much desired bass to add to my family of basses. I had the chance to finally play the Stingray at a 6hr straight rehearsal, and it just fits right. So when you play an instrument that feels right, how can one not brag about it? I am super delighted with the instrument, and I finally got to play it at an extensive rehearsal session on Sunday with the up-coming ABBA Spectacular shows for Melbourne and Sydney. I’m traditionally a 4 string player. While I’ve dabbled with 7 string, 5 string and more, I keep coming back to this. It’s simple, and has done the job for decades for electric bassists. I’ve not yet explored every possibility I can with the 4 strings I have, let alone jumping to more. I selected this specific bass due to the beautiful roasted maple neck and the access I have to the higher frets as well as the room for my right hand to slap and not get tangled up in too narrow a string spacing, or fumble with a pickup getting in the way. I also wanted the 3 band EQ due to some of the larger shows I play without an amp. Not having an amp on stage has its merits and its curses. However, having a Pre-amp and EQ on my pedalboard was one thing. Having it at my fingertips is amazing. So I wanted Musicman’s newly designed 18V active system to work in any environment with any style of music at any venue with any amp or not, as it were. I can’t wait to play the living daylights out of this bass. Thanks Musicman and Ernie Ball. Now, why did they choose me? I know thousands of musicians and artists that would love an endorsement from their favourite instrument makers. But here’s the lowdown on how to get started. You need to be an active professional. Having a regularly updated website with followers as well as an active social media following. The numbers don’t have to be high. After all, I’m not famous with 1,000,000 followers… YET. However, you also have to be extremely well rehearsed, and active with live gigs, recording sessions and so on. Of course, an endorsement doesn’t come free. I have my obligations, and I will be respecting them by making sure that my Stingray is visible at my big concerts as well as my smaller, local shows. Essentially, unless I’m playing double bass, I will be paying the Musicman. And as you can see from my social media, I spend my entire life playing music, recording music, or doing something related to music. I guess Musicman was happy to invest in me because they can be assured that I will be invested in them. An endorsement is a relationship. You give me things, I will give you things in return. That’s just how the world works, and I am more than happy to be given this amazing opportunity to perform with what I can comfortably say is the best bass I’ve ever owned. Thanks again guys! With more great news, I had lots of fun with a very gruelling day on Sunday. 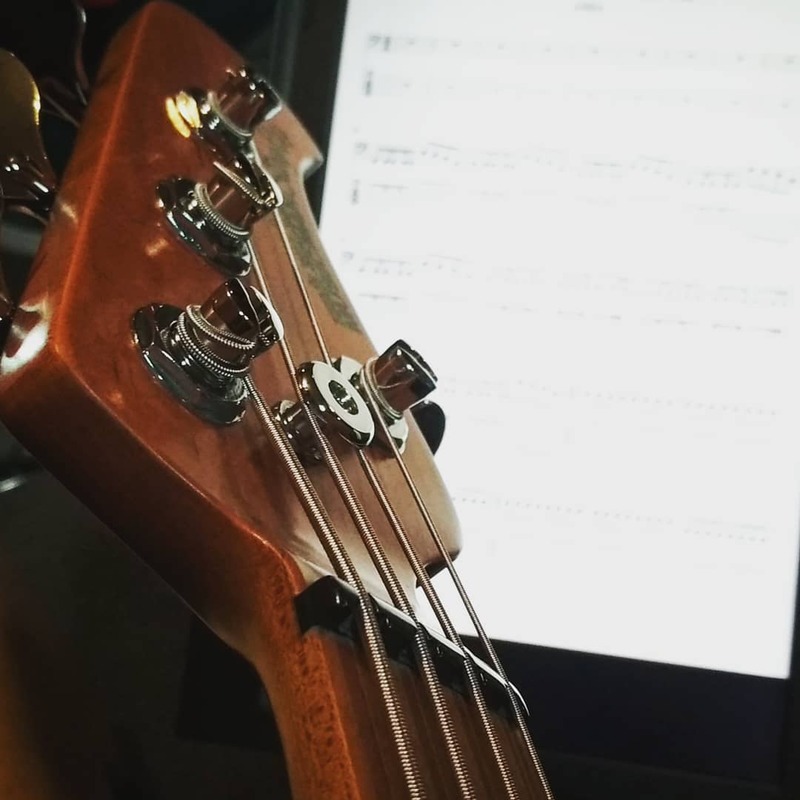 A big rehearsal session, kicking off the first of quite a few rehearsals for the ABBA shows, followed by racing home and making it back in time to drop off my electric bass gear and loading the car up with my upright bass gear. My partner, the gem that she is, loaded my car and made me a sandwich. So when I arrived home, all I had to do was top up on a Vegemite sanga, and change my shirt and hat! Phew! It doesn’t sound like much, but unloading and reloading the car can take up to 5-10 minutes, plus grabbing a bite, and changing clothes from relaxed rehearsal attire to a gig ready outfit. All of a sudden, half an hour has passed and now you’re even later than you expected. 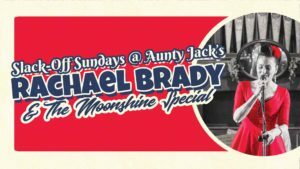 I then set off to Katoomba, where Rachael Brady & the Moonshine Special was setting up for Auntie Jack’s Slack-Off Sundays. It was a fun evening of music already, then I started to notice a tonne of my friends were all there. While I’ve been too busy to get to the place for leisure, I think it’s worth it when I get a night off. What a vibe! The band was cooking, red hot. To top it off, we’ll be playing at Miss Peaches on Thursday the 29th Dec from 7:00PM until late! What’s December got in store for us this month? Well, as you are already aware, there’s the Mid-Dec ABBA shows in Melbourne and Sydney. You can find all the details about that in my previous months post. You want more? Well alright! Rachael Brady & the Moonshine Special get’s set to play on the 11th of December at The Carrington Hotel, Katoomba. Details soon to follow. However, it is set to be a ripper of a night. Be sure to check back for details. As usual, follow us on Facebook and Instagram for immediate updates. 14th December is ABBA in Melbourne. Followed by 15th of December in Sydney. Rachael Brady & the Moonshine Special are back at The Carrington on the 17th of December. We’re giving you a reason to dance, so put on those shoes, grab your favourite lady and show her your slickest moves. 21st December is Blackbear BBQ, Entertainment Quarter with CK & the 45s. Get your rockin’ country swing on while enjoying a beautiful evening with great food and vibes. We’re bringing the good times to Moore Park! 23rd December is back at Auntie Jack’s with Rachael Brady. Picture this….. Pretty ladies dancing with handsome men. Burgers, shakes, and all the spoils of the U.S. from the 50’s right to you in Katoomba. This one’s worth dressing up for. Plenty of Mistletoe hanging around for all your lovers. That pretty much sums up December! Merry Christmas to all my friends, fans and supporters.